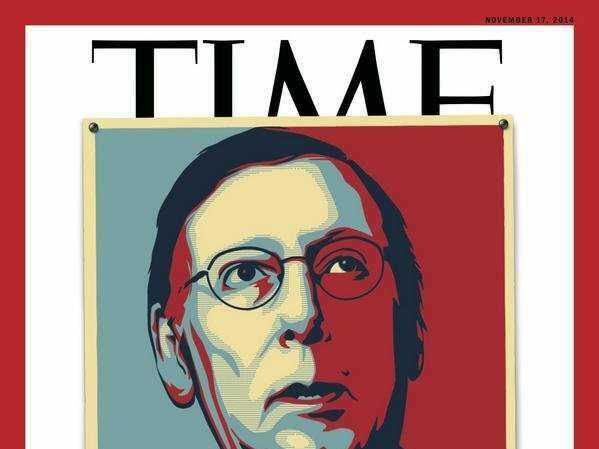 TIMETime magazine’s cover featuring Sen. Mitch McConnell (R-Kentucky). House Minority Leader Nancy Pelosi (D-California) turned into a media critic during a Thursday press conference where she singled out Time magazine for allegedly sexist coverage of congressional leadership changes. Pelosi noted Time put the current House Speaker John Boehner (R-Ohio) on the cover when his party took back the chamber in 2010. She also pointed out the magazine put the next Senate majority leader, Sen. Mitch McConnell (R-Kentucky), on its most recent cover. “When we won the House — and that was largely an initiative that I started around 2000, … that was a big thing. I was never on the front of Time magazine even though I was the first woman to be [speaker]. Isn’t that a curiosity — that the Republicans win; Boehner’s on the front of Time magazine. Mitch McConnell wins; he’s on the front of Time magazine. Isn’t it a pattern here?” Pelosi said Thursday, according to video posted by the Washington Examiner. Pelosi suggested Time was perhaps sending a message to her as a woman. “Who I am does not depend on any of that, with all respect to you. But as a woman, it’s like is there a message here? Is there something that we’re missing?” she added. Pelosi also criticised the media for asking when she would retire. She argued journalists would never have the same question for a male congressional leader. Time magazine did not immediately respond to a request for comment from Business Insider. Watch Pelosi make her criticism below, via the Examiner.